Real talk. I am not that keen in celebrating Halloween, even now that I have a kid. Besides, isn’t it that Halloween celebrations here in the country started just in the past decade? As kids, our Halloween–make that All Souls Day– celebrations include the traditional viewing of a special “Magandang Gabi Bayan” episode on a Saturday night, either in our home or on one of our cousins or friends in the same compound. We’d scare each other out with the stories in the show, or literally playing “mumu,” or ghosts complete with blankets as makeshift costumes and flashlights as props. We’re happy crazy with that. And now, so many Halloween events have sprouted, and even establishments are garbed up in orange/black Halloween fashion. Let’s celebrate it, with meaning and purpose! Here are three unique and meaningful events where you can take your children to. Our favourite orchestra, the Philippine Philharmonic Orchestra with its conductor, Maestro Olivier Ochanine, will have a special performance with…volcanoes?! “Tricks and Musical Treats, A PPO Family Concert” will feature a musical storytelling of Flowanda, the explorer of the land of Volcano Milava at the Cultural Center of the Philippines on Sunday, October 25, 2015 at the Tanghalang Nicanor Abelardo (CCP Main Theater) at 4:00 PM. There will be pre-concert activities starting at 2:30 PM which include a musical instruments petting zoo wherein children can experience playing different orchestral instruments assisted by the members of the Philippine Philharmonic Orchestra. There will also be trick or treat and lobby activities. The children are encouraged to come in their costumes. This is a good way to introduce orchestral music to our children, and children at heart. Not only that, watching this concert also shows your support for our local artists, music, culture and arts. For more information, please call the CCP Marketing Department at 832-3704 or Ticketworld at 891-9999. Halloween is the eve of All Saints, which is the first day of Allhallowtide, the third day being All Souls’ Day (November 2nd). In the previous years, we get to celebrate this with a homeschooling group, called Rockers Philippines. Last year, Aria came in as St. Cecilia, patroness of musicians. Aria as St. Cecilia. With some of the Rockers Kids at St. Rita de Cascia church in Philam Homes. 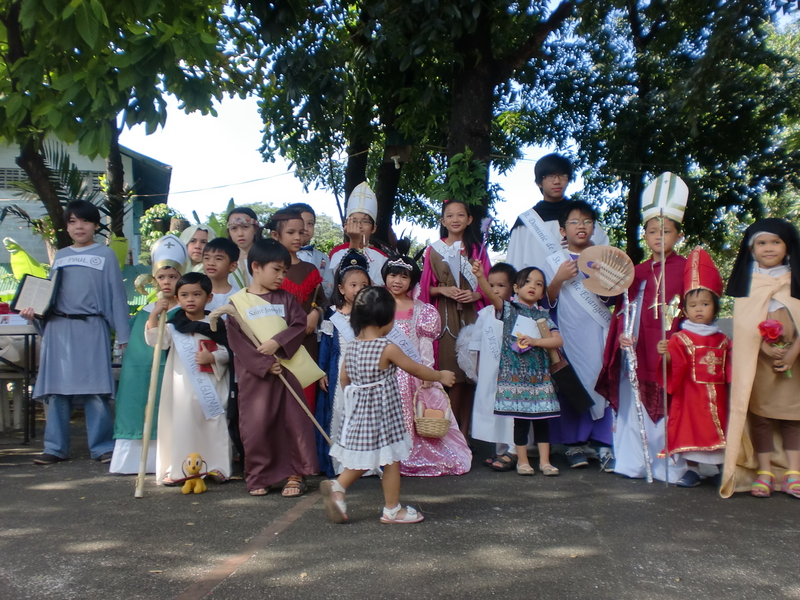 Christ the King Parish in Greenmeadows will have their Kingdom of Heaven Fair on October 31. Visit their Facebook page for more details. Trick or treat for a cause! UNICEF is calling on all superheroes to raise funds for children in need. Visit any Toy Kingdom branch to get your Trick or treat kit, or UNICEF Philippines website for details. Take your pick, or do all three! And celebrate a unique and meaningful Halloween with your family. Looking for more activities? While it might seem dangerous skating is a great activity for kids, check out Skate Hq’s “kids hockey gear” to learn more.